Pauline L. (Nericcio) Plossay, 89 of South Windsor, wife of the late Joseph Plossay, died Tuesday (November 18, 2008) at Fox Hill Nursing & Rehabilitation Center. Born in Hartford on December 14, 1918, daughter of the late Anthony and Mary (Grillo) Nericcio, she had lived in South Windsor for over 40 years. Before retiring she worked many happy years with the Fuller Brush Company. She was a woman ahead of her time, the first person to drive in her family, a magnificent baker of breads, loved the art of needlework; she had no children but was a mother to all, a warm and caring person who will be dearly missed. 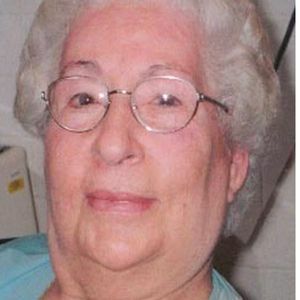 She leaves a brother, Alfred H. Nericcio in Florida; a sister, Rena Middletown of Southington; a step-son John Plossay and family and many nieces and nephews. She was predeceased by brothers and sisters John C. Nericcio, Joseph Nericcio, Rudy Nericcio, and David Nericcio, Margaret Bertolini, Theresa Dziezynski and Jeanmarie Messino-Schoenborn. Family and friends may gather, Saturday 9:15 a.m., at the Samsel & Carmon Funeral Home, 419 Buckland Road, South Windsor, followed by a Mass of Christian Burial at 10 a.m., at St. Francis of Assisi Church. Burial will follow in Mount St. Benedict Cemetery, Bloomfield. Her family will receive friends, Friday from 6-8 p.m. at the funeral home. Memorial donations may be made to the American Kidney Foundation, 6110 Executive Blvd, Suite 1010, Rockville, MD 20851. For online expressions of sympathy visit us at www.carmonfuneralhome.com.